The Avg. Group Discount is 17.1%! "Great Stay. They went out of their way!" Good value. good breakfast. good location. We stayed as a group and got great group rate. The general manager went out of his way to ask if we needed anything special. Would stay again! Clean and new and comfy. 23-Apr-2018 Verified Review, stayed from Fri Apr 20 to Sun Apr 22 2018 at a $112.00 group rate (16% discount). Enjoy the service cleanliness meet my expectations. 15-Apr-2018 Verified Review, stayed from Fri Apr 13 to Sat Apr 14 2018 at a $93.00 group rate (15% discount). Thank you so much for the great feedback on your past stay. We strive to make all our guests this happy.Bill M.
Really good service, clean place and rooms Really good host services. 21-Jan-2018 Verified Review, stayed from Fri Jan 19 to Sun Jan 21 2018 at a $97.00 group rate (15% discount). Sorry I didn't respond sooner. I am not so tech savy, but noticed this option and wanted to thank you. NEWLEY RENOVATED HOTEL178 ROOMS * 6 LEVELS, 3 ELEVATORS, Interior CORRIDORS * FREE SHUTTLE TO DFW AIRPORT, AT&T STADIUM, GLOBELIFE PARK, SIX FLAGS AND 5 MILE RADIUS * SIX FLAG/Hurricane Harbor/ ATT tour DISCOUNT TICKETS AVAILABLE AT FRONT DESK * BUSINESS CENTER AND BANQUET FACILITY WITH HIGH SPEED INTERNET ACCESS * FLEXIBLE MEETING AND BANQUET FACILITIES FOR UP TO 220 PEOPLE * FREE HOT BREAKFAST/HOT WAFFLES AVAILABLE * IN ROOM FRIDGE AND MICROWAVE IN ALL ROOMS * GUEST LAUNDRY * SAME DAY VALET SERVICE * ONSITE MARKET PLACE WITH FOOD, BEVERAGES AND TOLIETRIES * FAX & COPY SERVICE AVAILABLEApproximately 6/06, new facility 178 rooms, six stories, meeting room of 4000 square feet, banquet seating for 150 people (can be split up) - List of Caterers available. Local Shuttle Info: 7am-11pm, a 5 mile radius of the hotel. We have a free hot breakfast included in the rate, which includes eggs, sausage, waffles, biscuits & gravy, fruit, cereal, yogurts, muffins, bagels, assorted juices and coffee and assorted teas. Free and ample parking for both vehicles and buses. 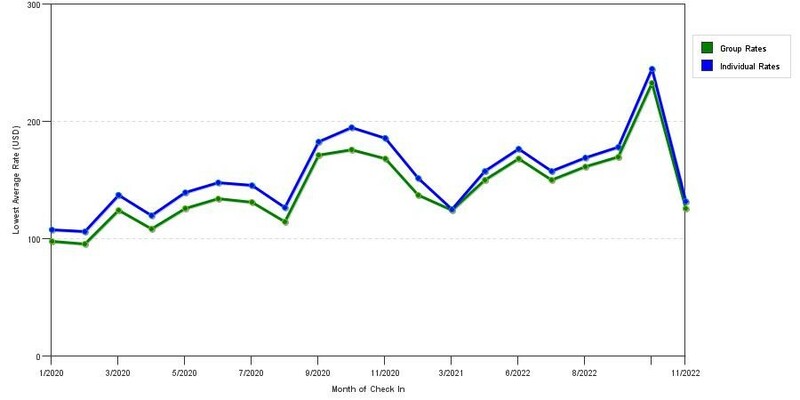 Above shows trends of room prices for both our group prices and the lowest individual traveler prices our rate checker could find at the time the group bid was submitted. The best group discount displayed is 30.5% in the month of August 2017 and the highest average individual rate is $194 in the month of October 2019. This chart will show past seasonality and also project future months. If you are flexible with dates, you may want to consider staying at La Quinta Inn at Suites Arlington North 6 Flags Dr by Wyndham in a month when rates are lower. Below are the meeting, banquet, conference and event spaces at La Quinta Inn at Suites Arlington North 6 Flags Dr by Wyndham. Feel free to use the La Quinta Inn at Suites Arlington North 6 Flags Dr by Wyndham meeting space capacities chart below to help in your event planning. Hotel Planner specializes in Arlington event planning for sleeping rooms and meeting space for corporate events, weddings, parties, conventions, negotiated rates and trade shows. 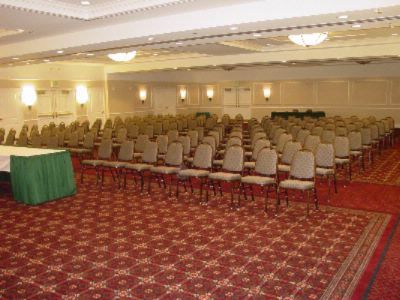 120 x 26 x 10 Ft.
Friday and Saturday full ballroom rental is $1500 per night plus tax and service fee. Rates below are Sun- Thursday. 8 x 20 x 10 Ft.
130 x 45 x 12 Ft.